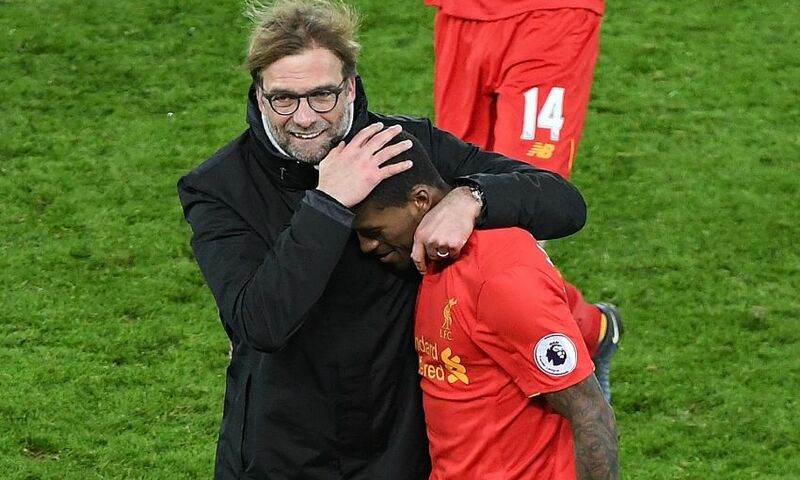 Jürgen Klopp discussed the manner of his team's performance, the impact of Daniel Sturridge and the next task for Liverpool after Tuesday's 4-1 home victory over Stoke City. The Reds were ultimately comfortable winners despite falling behind to a Jonathan Walters header, with Adam Lallana and Roberto Firmino turning the game around before half-time. A Giannelli Imbula own goal provided a cushion after the interval and substitute Sturridge then sealed a third successive victory with a fourth. Afterwards, Klopp spoke to journalists about how the game unfolded and why he is already looking ahead to the visit of Manchester City. Confidence is not a problem of the team at the moment. We know about our quality. We don’t show it all the time, but the start of the game was really difficult because the plan of Stoke was obviously to press really high, especially with the two strikers. We were not patient enough in our passing game in these moments. It was pressure, of course, but we could have done much better. So it became a wild game and when they had the ball it was immediately in the air and Crouch was outstanding. It was really difficult to defend. With the second balls, Joe Allen was brilliant in the beginning. So we had to work really hard and the game was completely open. In creating our moments, we again struggled a little bit with protection, with our position game. A lot of things we could have done better, but we forced two goals with our quality; they were really good and both really important. 2-1 up and then we could again adjust a little bit at half-time and speak about a few things. The boys did better and scored a wonderful third goal and then Daniel closed the game – that was really important. It was clear Stoke are a good team. Obviously Mark Hughes likes to bring Crouch against Liverpool; I don’t know exactly how often we have played them now, but Crouch was always involved I think. He is a very important player, but it’s not the moment to praise single players. I don’t think they need it in this moment, they are all happy about the team performance, the result and the goals we scored. He has been doing really well over the long-term, but it’s not a moment to lean back or whatever. He will not. But my feeling is always that when we speak about one player, we speak always about the past. I already think about the next game, to be honest, and hopefully we can do better because we can do better than we did tonight. But for tonight, it was absolutely OK. It is [a big game]. It is for both. I heard Pep Guardiola was in the stadium tonight; I am not sure he watched a lot of games in the last few weeks from the stadiums of the opponents, so that’s a first sign it’s a special game and we are already looking forward to it. It’s a difficult game for both teams, but exciting and the best thing is it’s at Anfield. I am really looking forward to it. They are an outstandingly good side and we are not too bad, so it will be a nice game. I was more than pleased, it was a perfect goal. In a situation like this, 3-1 up but still intense, and then you can then use the quality Daniel has, that’s perfect. In this moment, you can learn a lot of things in life, but not being in this position in this moment – that’s natural and doing what he did was perfect. It was a wonderful goal. It was very, very important because it closed the game and gave us the opportunity to cool down a little bit. Unusual, I don’t know. I did it a lot in the past, but obviously it’s not too easy anymore because it's more a signing hour than you can watch a game. Maybe he saw nothing. Hopefully we had no security and Pep had to write all the autographs! The game is on December 31 and whatever I say tonight can’t win it. But maybe I could say a few things that would make it a bit more difficult for us to win it, so it’s probably best I shut my mouth! He’s very important but if only Adam was good at keeping the ball then we have a big problem. I saw no player who didn’t do his job tonight. It was not easy. We could have done better, especially in the last 15 minutes – 4-1 up, we ran with the ball still on fire and that makes not too much sense. But it’s part of our character so I have not too big a problem with it. In the first half, we could have done a lot better, all of us, but Adam is very important. Alone, it could be difficult for him.